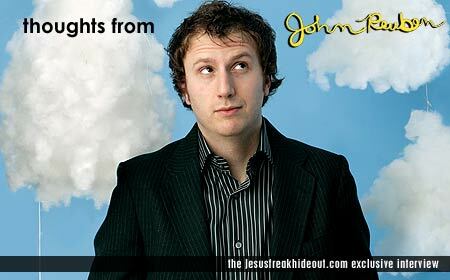 Jesus freak Hideout (John DiBiase): How have you approached the recording of your latest record The Boy Vs. The Cynic differently than you have on previous records? John Reuben: Similar. Similar things as with the last one. There's a lot of the same team on it. I think the one big difference is I wrote two albums this time around. One record was a very intentional record and that was my 'John Reuben' record. And the other record was a side project. It was more of a creative outlet. So I handed both projects in and the label [Gotee Records] liked the side project better. *laughs* So we took some of the Reuben record and took some of the side project and combined the two, thus giving us the record we have! JFH: Are you still going to do a side project? John Reuben: Hmm, maybe someday. But I'm afraid if I do it, they're just going to want to use it for the Reuben record anyway. *smiles* So I don't think there's any point. JFH: What do you hope to achieve with this album that you haven't before with the other ones? John Reuben: Um... Success. *laughter* Nah, I don't know. Y'know, I never have any super intentional plans. I don't like to be too committed to thinking "this" is gonna happen or "that" is gonna happen. I am a firm believer that you work as hard as you can, you're diligent, and God's gonna do with it what He wants to do with it. Whether it's big or little, it's still going to do what it needs to do and get into the hands it needs to get into. But obviously, I want to continue to grow and keep solidifying a larger audience perhaps who can really jump into it and get something from it. JFH: What does the song "Nuisance" mean? JFH: Where'd you get the idea for the video? JFH: How is The Boy Vs. The Cynic different thematically from your previous records? John Reuben: Yeah, everytime someone tells me they've made a concept record, I feel you have to stretch to really hear how it all comes together as one record. But I think this is the closest thing to a concept record I've ever had. I think every song kinda works together. The idea of The Boy Vs. The Cynic is the tension between the wide-eyed optimism in youthfulness where you think nothing can go wrong, "I've got the world ahead of me. I'm gonna be a go-getter." And then the there's the realities of what really goes on and the harshness and the harsh truth that you're exposed to as you get older. And then becoming bitter and cynical about life in general. And, I've said this before to people, but both are not right. Not that wide-eyed optimism is wrong, I'm saying both are to a certain degree. Ignorance really isn't bliss but also being bitter and hating the world isn't the right way. I think it's knowing who Jesus is, and knowing how to usher in His perspective, and how to be hopeful and optimistic but also being willing to embrace the realities and the sufferings that go on in life. So I think somewhere in that is the theme for the record. JFH: I know you had originally wanted to keep the heavier-themed songs for your side project. Are you kind of disappointed they're mixed together for this record? John Reuben: No, I'm not. I'm not at all actually. If a record is too intense and there's never moments of relief, I don't think that's the best representation of life. And if the album is only happy-go-lucky, that's not a good representation of life. But as a whole, I think the record is the best representation of who I am. I mean to a "T." I like the quirky pop songs and I also like the thought-provoking, more intense moments that are on the record as well. I'm actually really happy that my label wants me to have the freedom to say that kind of stuff. And plus, I think I'm giving people more credit now. I'm trusting that people will take the time to think through some songs that might be a little more challenging, opposed to just write them off. Or be like "What's he trying to say there? I don't like that!" But, especially for Christians out there, we read a very complex book, and sometimes you just have to look into it a little more. I'm just going to show people respect and believe they will do the same. JFH: Yeah, I noticed the heavier songs are heavier thematically than even on Professional Rapper. You go deeper into it and tell it like it is. You even say things most artists are too afraid to. I like that. John Reuben: Definitely, man. It's funny, y'know? It's not like I'm trying to stir up any kind of controversy, I just wrote what was on my heart. JFH: What inspired the cover art? John Reuben: *laughs* Y'know it's funny. Our art guy really helped to pull this set together. One of the guys from Spoken put it, 'it's got a feel somewhere between "Where The Sidewalk Ends" and Tim Burton.' *laughs* And I said they're both very cool things. So yeah, I'm actually stoked about the packaging. I like it quite a bit. JFH: What is your songwriting process like? Do you normally just sit down and write a song and it's done, or does it take some time to really work through it? John Reuben: It takes awhile. A little bit because I'm a perfectionist and I can kill songs because I analyze them too much. For me it takes awhile because I like to do it and then step back and listen and observe. I mean sometimes it's right on point, but for the most part, I like them to be right. I like there to be big moments when there needs to be big moments and I don't want there to be big moments every moment cause then it loses its impact. So I just kind of sit back and listen to the record as a whole and I think that's where production, being able to be a producer, really comes into play. Cause I can really step back, oversee it, and just kind of piece it together. JFH: What pleases you most about the new record? A particular song or songwriting experience? John Reuben: There are a couple songs where I really felt like it worked. Kind of in my head, y'know, you always knew it could work, but you never found out the right formula to make it work without it sounding forced. I felt like I was able to nail it on a few of these tracks. Like a couple of the songs I did with Tim Skipper of House Of Heroes, like the title track. I love the guy's voice. I love the band, they're an amazing band. I just really like the way we were able to bring some intense lyrics and were really able to bring it in together with some pretty melodies. So I was really stoked about how it turned out. JFH: Tell a little about the song "Follow Your Leader." John Reuben: "Follow Your Leader" was inspired by the media and people who get their information from media of any kind. Whether it be Christian media or liberal media, and doing what it said or buying into its "propaganda," I guess. I think it came around the time of the election and I was just really blown away with how people didn't think for themselves a lot of times, or they didn't take the time to really put themselves in other people's shoes. They just kind of picked a side and followed their leader. And I mean that literally on both sides. So I think it was just the arrogance and being a little frustrated at the power of persuasion that the people can have who are in that position and not being responsible with that position. JFH: How about "There's Only Forgiveness?" John Reuben: "There's Only Forgiveness" was really inspired by people -- I have a line in there that says "It's much easier to be miserable than vulnerable." And I think the gist of it is it's easy to be bitter. It's easy to hate the world and hate those who have done wrong to you, but there's no freedom in that. It doesn't matter, you could be repaid a million times for the wrong that people have done to you, and it's not going to buy out the bitterness that's in your heart. The only way to freedom - true freedom - whether it be from racial reconciliation or any tensions that go on, there's only forgiveness. I guess the ultimate perspective or picture of that is none of us are worth what Jesus did on the cross. None of us are worth that. There's nothing we can do to begin to repay that debt. I know, for myself, I get so angry sometimes and I relish in my bitterness and my frustration towards people who have done wrong to me, that the end result is only more bitterness. I could vent my feelings and get 'em out in the air and discuss it with people, but it doesn't do any good. Venting only gets you so far. It will only relieve you for a few minutes. But really the only way is saying "Man, I forgive you. I forgive you and I love you." People throw it around, though. They put it on Precious Moments dolls and make it such a light thing, but it's such an intense thing. It's the fabric of the Gospel, y'know what I mean? JFH: What kind of tour plans do you have? John Reuben: Um. U2? *laughs* Doing this Pillar, Thousand Foot Krutch tour that we just started, but there are some things that are in the making for the Fall. So we're trying to solidify some things. But yeah, I don't know yet! But hopefully I'll get to stay on the road.